Sixteen teams took part in the Eastern Europe qualifier, and clashed in a single elimination bracket. Only citizens of Belarus, Bulgaria, Moldova and Romania could attend this tournament. The Belarusians of Nemiga defeated $GODMODE$ 16:5 on Cobblestone, and Prophecy 16:13 on Train. Commencing from the semifinals the format changed from Bo1 to Bo3. Here they defeated BPro Gaming 2 to 1. The final matchup against ex-Outlaws took place during the night of October 5th. Nemiga had the upper hand with a 2:1 score. Nemiga will join 19 more teams at the European Finals to battle for a $92,500 prize pool and the chance to qualify for the Main Event. The LAN event will take place in Barcelona, Spain from November 22nd to 26th. The first map, Mirage, was selected by ex-Outlaws. 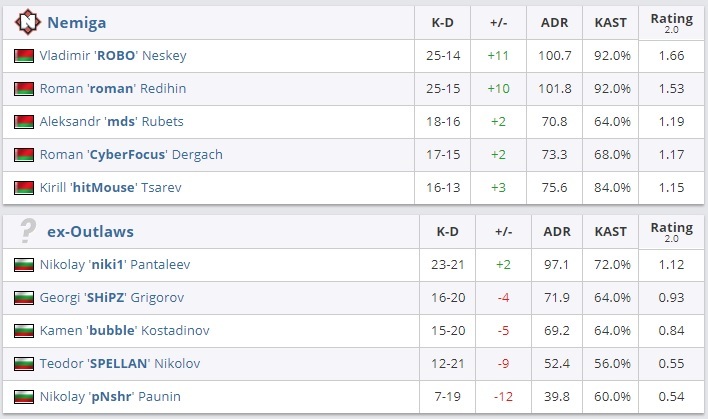 Nemiga won the pistol round both as Terrorists and CT, showing an impressive performance on each side, and ending the match 16:9. Vladimir “ROBO” Neskey and Roman “roman” Redihin were the best players of the match: they scored 25 kills each and got a rating above 1.5. Three members of their team obtained an average damage per round of 100 or above, which demonstrates that the game was one-sided. Cobblestone was a hard-fought map. Nemiga triumphed thanks to a better Terrorist side that brought more rounds in their pocket during the first half. Both teams defused at least three bombs. With a 16:13 score Nemiga Gaming secured the Eastern Europe qualifier for WESG. We will see them in Barcelona on November 22nd. Ladislav "GuardiaN" Kovács will compete in the qualifier for WESG 2017 with the team Slovensko. ENergy Esports triumphed at ESL African Championship Season 2 overwhelming Bravado Gaming 3 to 0 in the finals.